A nomadic family in Mongolia's Gobi desert faces a problem when a white camel colt is born in a difficult delivery and the mother rejects it. Repeated efforts by the extended family to get the mother to nurse the colt fail. The colt stands alone and cries for its mother. The family worries that the colt will not survive. Finally, Dude (Enkhbulgan Ikhbayar), the older boy, is sent to a nearby town to find a musician who can perform a "Hoos" ceremony. Little Ugna (Uuganbaatar Ikhbayar) begs to go along. The two boys travel for miles across the desert, stopping at a neighbor's yert, where Ugna is delighted by his first encounter with television. They travel on to the village, and then return home with word that a musician is on the way. A musical ceremony is performed in an effort to get the mother camel to accept her colt. 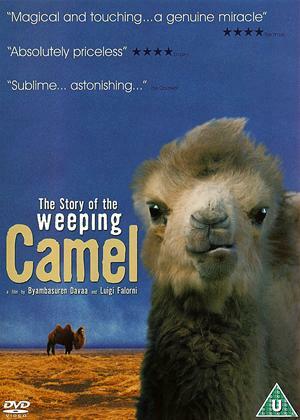 The Story of the Weeping Camel is a blend of documentary footage and narrative. Filmmakers Luigi Falorni and Byambasuren Davaa cast a real nomad family of herders and shot many of the events in the film as they occurred. The Story of the Weeping Camel was selected by the Film Society of Lincoln Center and the Museum of Modern Art for inclusion in the 2004 edition of New Directors/New Films.